If you’re a president known for tweeting, of course, there’s only one way to show any empathy. It was Trump in what would be known as a “mulligan” in golf–his second visit to Houston since Hurricane Harvey demolished Texas. Trump arrived on Saturday at the NRG shelter in Houston and on the make-good finally seemed to understand his role as comforter-in-chief. When he spoke to reporters, he seemed impressed by what he saw. “Very happy with the way everything’s been done, a lot of love,” said the president about the aid effort. Trump likes to throw that word “love” around these days. Let’s see if he finds any for DACA recipients on Tuesday. But on this day, Trump said people he talked with at the shelter were happy. Of course, the whole world saw the state of American infrastructure under Trump. People in high water trudging along as if the U.S. were a developing country in denial of climate change. Will this Trump show of empathy reverse first impressions? Sure, he’s promised a personal donation of a million dollars to help. And he’s asking Congress for $79 billion for Houston’s recovery. So he’s done what’s expected. Will it be enough to undo what could be the costliest natural disaster in U.S. history? While some residents were able to pick through the debris of their material lives on Saturday, that didn’t include Jessica Kong and her mother and brother. 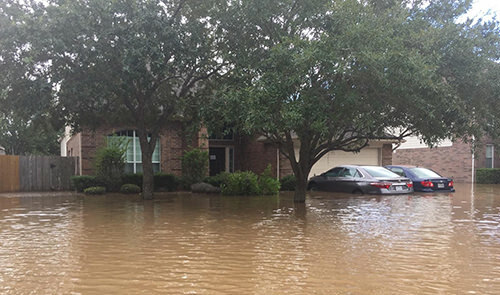 The home where they live to the west of Houston in Katy–where the reservoir releases made Harvey’s impact even more formidable–was still underwater. The Kongs lived in one of the estimated 200,000 homes in Houston damaged by Harvey. Since Monday, August 28, the family voluntarily evacuated, when the water was just thigh high. “I really don’t know when we’ll be back,” Jessica told me by phone on Friday. She shared a picture of her home that a neighbor took on Thursday. Her family has already applied for FEMA relief online. Reports say more than 450,000 have already registered. The Kongs have also contacted their homeowner’s insurance company. After staying in a shelter in the local middle school, they’ve since relocated to Jessica’s older sister’s suburban home, which did not suffer from Harvey’s rains. And even now, as she contemplates the laborious task of rebuilding after Harvey, she marvels at how strong her core family has been throughout the whole ordeal, relying on each other, friends, neighbors, and extended family. She feels that the storm has prioritized the importance of things in her life. She paused as she thought of a friend who lived in Dickinson, a more heavily hit area toward the coast. That friend, a young woman, had been diagnosed with cancer this year. And she lost everything in the storm. It’s a reminder to Kong of her relative good fortune. As she and her family rushed out of the house, they took only what was necessary. But one item she had to leave behind was a special portrait of her mom that her late father, who died of cancer in 2005, commissioned for her 50th birthday. “It was too big,” Kong said. They placed it on the second floor of the home and hoped for the best when they return. On the podcast Emil Amok’s Takeout, she talked about how the family left her home when the water was still about thigh high and shared what she thinks her lasting memories of Harvey will be. And she contemplated the actions of Donald Trump, and if a show of compassion to Harvey victims could force his hand on DACA or expose him as a hypocrite. Kong said she’s been disappointed by Trump’s performance to date and doesn’t expect much. Listen to what she said on the podcast, Emil Amok’s Takeout. 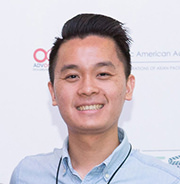 Also on the podcast is Katrina survivor Steven Wu, 25, who talks about how the experience helped him to both cope and assist his neighbors in his new hometown, Houston. “I have an idea how to help, ” he said on an interview conducted Aug. 31 for the podcast, Emil Amok’s Takeout. He talked about the power of the group hug, as he witnessed the love shared by volunteers who comforted Harvey victims in the shelters. Wu, working as a volunteer for the Organization of Chinese Americans, said there were 17 shelters set up in churches and community centers in the west part of the county specifically to help out Asian Americans who needed language assistance. Some even offered the comfort of Asian food. Such a detail can be important in limiting the trauma that comes with mass evacuations during natural disasters. Wu said that his Katrina experience as a 13-year-old made him “grow up quickly.” He worries about the kids who will have to deal with the trauma of Harvey, because he knows how Katrina impacted him. He’s also worried about FEMA and the insurance process. “FEMA was a trainwreck,” Wu said about his Katrina experience. which included life in a FEMA trailer outside his damaged home, eating MREs and living with an inconsistent water supply. The memory of that motivates him to help out for as long as necessary in the place he’s called home the last three years. He also added this for those who may feel personally overwhelmed by the losses from Harvey. 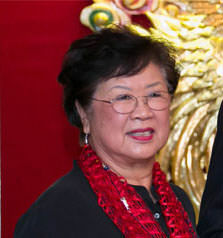 Martha Wong, 78, is an Asian American political legend. The first Asian American woman elected to the Texas state house, she was also the first Asian American member of the Houston City Council. She’s also a Republican. Wong wasn’t a Trump supporter at first, but became one by the election. 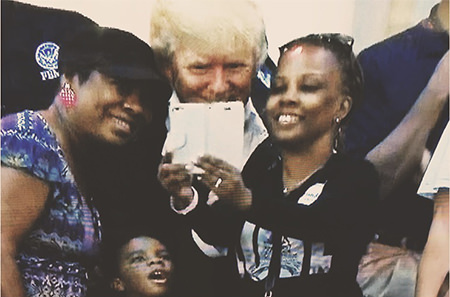 She said Trump may not be great as far as empathy goes, but she was still satisfied by his first visit. And she has no doubt Houston will be back on its feet. She was untouched by Harvey, living in a high-rise next to Joel Osteen’s Lakewood Church. We talked about that and other things, including Houston politics and how small government conservatives might sing a different tune in post-Harvey politics. And we talk about why Houston floods so much. Listen to my conversation with Wong on the podcast here. NOTE: OCA of Greater Houston, which AALDEF represented in a voting rights case in Texas, has helped to establish the Harvey AAPI Community Relief Fund. Help the Asian American community in the Houston area by making a donation: https://www.ocahouston.org/harveyrelief.